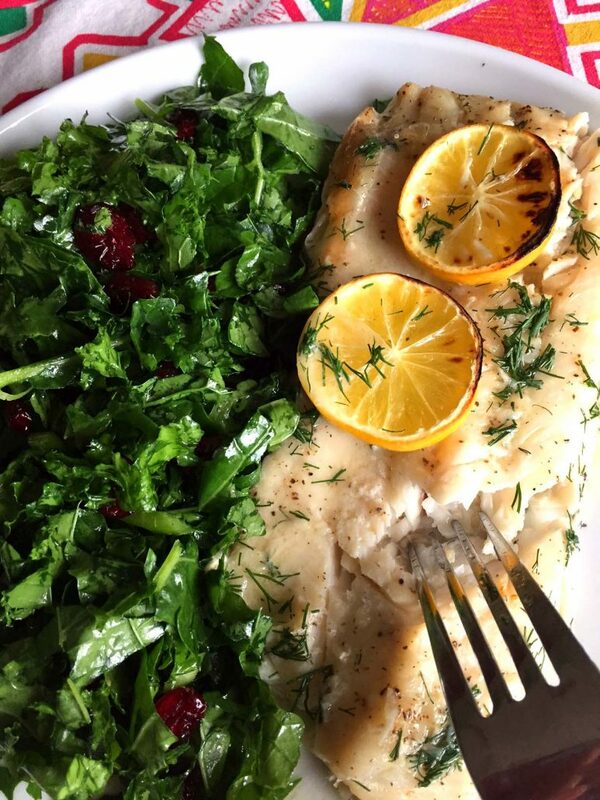 This amazing baked fish with lemon garlic butter sauce is out of this world! 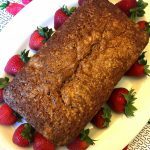 So easy to make and so tender, juicy and flavorful! This is my favorite way to make tilapia or other white fish! Lemon butter and fish is such a classic combination! I already make pan-fried lemon butter fish and lemon butter fish in foil packets and this is my latest twist on an old classic. This time I’m baking the fish in the oven and add lots of minced garlic to it! Want the recipe for the salad that’s served with this fish on the above picture? It’s my simple kale salad with dried cranberries! Lemon butter sauce truly enhances the flavor of the mild white fish, and when you add garlic to it, it gives it the whole new dimension! If you bought white fish or tilapia fillets, you owe it to yourself to try this mouthwatering recipe! Baking the fish is so much easier than frying, I rarely fry the fish these days. No standing over the stove, no splattering oil and most importantly not having to clean the oil splatters all over your stove! 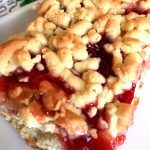 This recipe is so easy, any beginner can make it. 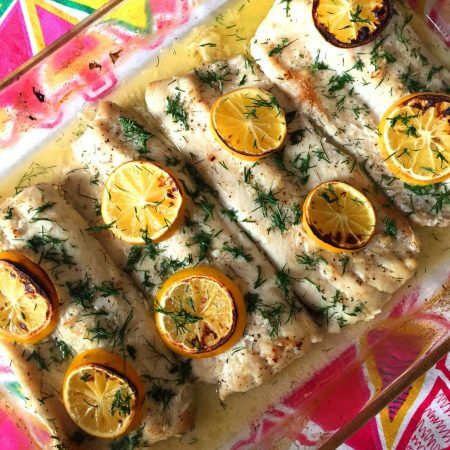 All you need to do is rub the tilapia fillets with melted butter and minced garlic, squeeze the fresh lemon juice over the fish, put the fish in a baking dish, arrange lemon slices on top and bake for 20 minutes! 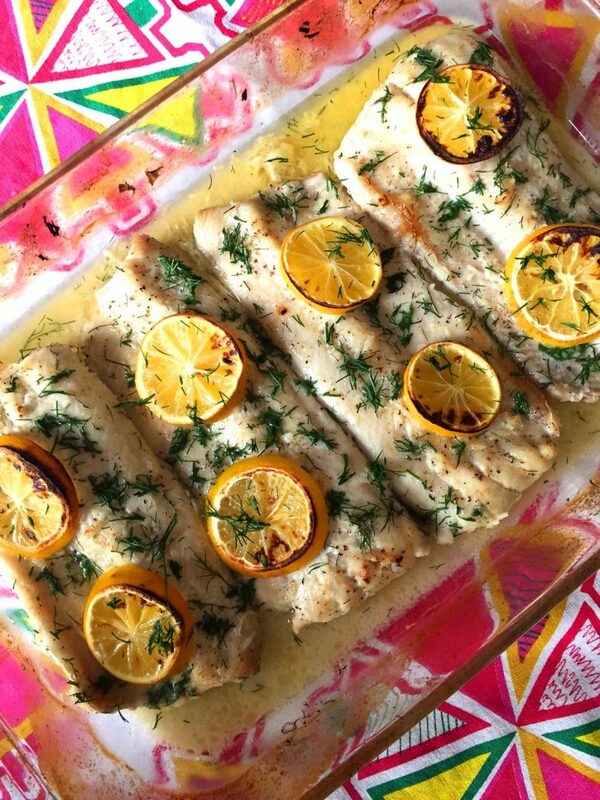 Lemon slices on top of this baked fish release even more lemon juice when the fish bakes, and they make this fish dish look so impressive! When it’s done baking, sprinkle the fresh herbs all over the fish to make it even more yummy and mouthwatering! 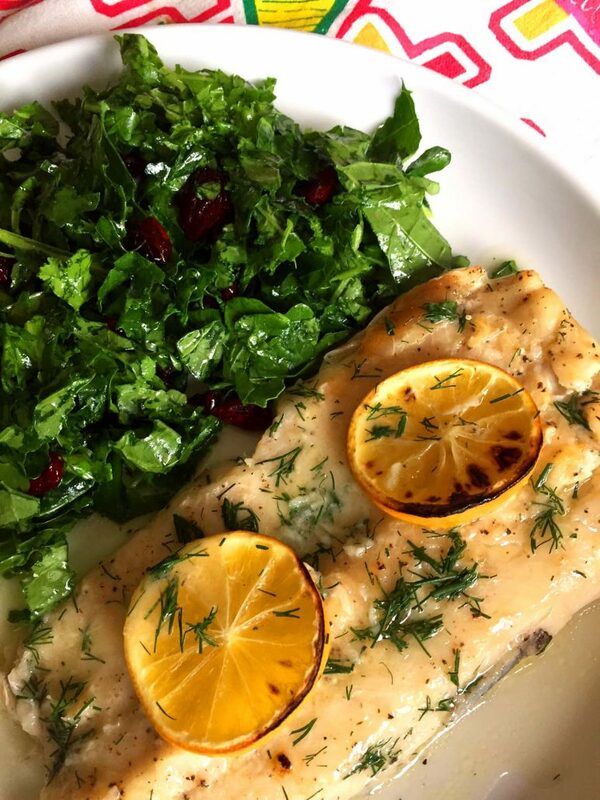 This baked lemon butter fish is amazing! This is my favorite way to cook tilapia or other white fish! Super easy to make and so flavorful with lemon garlic butter sauce! Preheat the oven to 425F. Spray a non-stick 9x13 baking dish with non-stick cooking spray. In a bowl, mix together melted butter and minced garlic. Rub the fish with garlic butter mixture all over, so all the fish is coated with it. Put the fish in a baking dish in a single layer. Squeeze 1 lemon over the fish. Slice the second lemon and arrange the lemon slices on top of the fish fillets. Put the fish in the oven and bake for 20 minutes, or until the fish flakes easily with a fork. 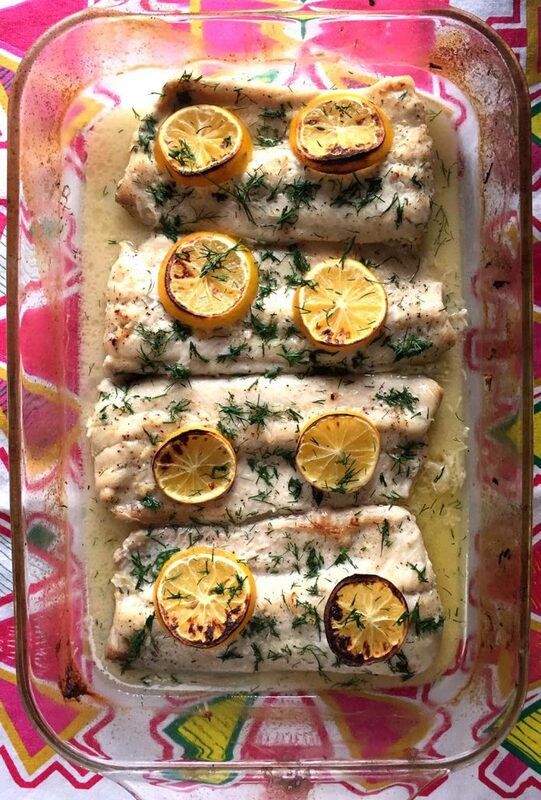 Take the baked fish out of the oven and sprinkle with fresh dill or parsley.